A US Navy official queried whether the missing plane ever went there. 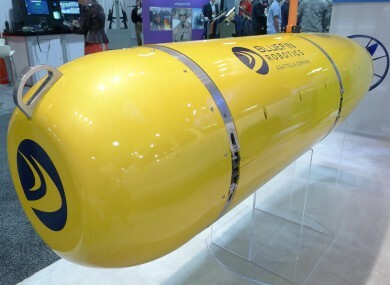 A Bluefin 21, a torpedo-shaped underwater robot and the kind used in the search for MH370, seen on display at the Special Operations Forces Industry conference. AUSTRALIA HAS RULED out a large swathe of Indian Ocean as Malaysian Flight MH370′s final resting place, compounding the frustration of passengers’ relatives who are still without answers almost three months on. The Joint Agency Coordination Centre said a lengthy underwater search of an area where acoustic transmissions were detected in early April was now complete, as a US Navy official queried whether the missing plane ever went there. “The Joint Agency Coordination Centre can advise that no signs of aircraft debris have been found by the autonomous underwater vehicle since it joined the search effort,” JACC said. It added that the Australian Transport Safety Bureau had advised that “the area can now be discounted as the final resting place of MH370″ in an outcome that prompted anger and scorn from relatives still desperate for closure. It also sparked a strong reaction from Chinese Premier Li Keqiang, who urged Malaysia to assign a new search plan for the missing jet. “We expect Malaysia to take the leading and coordinating role, come up with a new search plan for the jet at an early date, and take the investigation seriously,” Li told Malaysian Prime Minister Najib Razak, who is on a visit to China, according to the official Xinhua news agency. Nearly two-thirds of the passengers on the Beijing-bound aircraft were from China. Australian ship Ocean Shield, which is carrying the US Bluefin-21 sub, has now left the area after scouring 850 square kilometres of sea bed for the jet that vanished flying from Kuala Lumpur to Beijing on March 8 carrying 239 people. Australian Deputy Prime Minister Warren Truss said the search was concentrated where the pings were detected because it was “the best information available at the time”, without commenting on whether they came from the black box. He added that Australia remained “very confident that the resting place of the aircraft is in the southern (Indian) Ocean”. A Chinese survey ship, Zhu Kezhen, is currently mapping areas of the ocean in preparation for the commercially contracted deep sea search, which is expected to begin in August and take up to 12 months. Email “No MH370 debris found where underwater pings were detected”. Feedback on “No MH370 debris found where underwater pings were detected”.